"I am a book lover, and find that, despite current so-called trends, I am drawn more and more to books, and indulging my passion for acquiring them. I have always supported independent bookstores and hesitated to buy books on the internet but make an exception for your site, which I consider also supports small booksellers and their passions for books. I've been ordering books on your site for 5 years and find the quality constantly improving, and always excellent. I've compared all other internet books sellers and find that your price range and quality of books available is always the best, and your service and website are excellent. In particular, your booksellers (for the most part) offer the most complete descriptions of books I have found on the web. I also love the fact that you have access to books in other languages (I speak and read French and Italian, too.). Needless to say, your website has become addictive to me, but what a lively addiction! Keep up the great work." AbeBooks have received a lot of media coverage recently. Some examples of the international coverage - over 3 continents - that the AbeBooks websites are receiving have been copied below. The Daily Telegraph - Simon Armitage interview. Greatest discovery online? Keep up-to-date by checking the online Press Room on AbeBooks. Calling all booksellers that offer book appraisals - AbeBooks is launching a new section dedicated to help people find rare book appraisers in order to have collections valued. Our new appraisal section will simply list AbeBooks’ booksellers that offer appraisal services – the list will be segmented by country and then state, province or county to help visitors to our sites locate a bookseller close to them. It is completely FREE to be listed in this section and it will include contact details. We are aware that many of our sellers conduct professional appraisals for individual collectors and institutions, and we are in a position to help thanks to the millions of booklovers that visit our sites. We are frequently contacted by people looking for appraisers so we also feel this section would be useful. The list of appraisers will have a permanent link from the home pages of our .com and .co.uk websites, and also the Australia/New Zealand micro-site. However, if you are not a member of any of these organisations but would still like be listed in the appraisal section then we simply need the name of an existing AbeBooks seller who is a member of one of these organisations and willing to vouch for you and your appraisal skills. Our antiquarian account manager Maria Hutchison will then have the final decision. As the Spring Book Fair season gets underway we have the details of some of the most important European Book Fairs for you. EVENT: Edinburgh Book Fair - Joint PBFA - ABA book fair. EVENT: London Book Fair - Book publishing trade fair. EVENT: Leipzig Book Fair - Book publishing and antiquarian book fair. EVENT: Salon du Livre - Paris: Book publishing trade fair. EVENT:Salon du livre ancien - Paris: Antiquarian book fair. EVENT: Valencia Book Fair: Second hand / Antiquarian book fair (open air). EVENT: Madrid Book Fair (feria de la Primavera): Second hand book fair (open air). EVENT: Turin Book Fair: Book publishing fair with Rare and Antiquarian section. Sellers can still register to exhibit at this fair until beginning of March. The search facility in the Rare Book Room has been updated, so that buyers will only find titles worth £15 or more. The change was made after having listened to sellers feedback about the irrelevant listings that appear in a search. The £15 minimum price limit will work to improve the quality and relevance of the search results for collectors using the Rare Book Room to place searches. Buyers will, however, still have the opportunity to turn off the pre selected price range and view all of the books should they wish to. In preparation for the launch of the Italian website later this year, Italy has now been added as a default country to your shipping matrix. 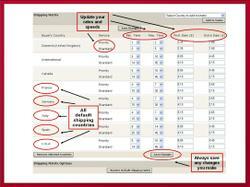 If you did not have Italy set as a shipping country you will see the default shipping rates and speeds set by AbeBooks - you can update your shipping matrix at any time to better reflect the services you use. Sellers who already have Italy entered as a shipping destination, need not update anything. The update will not overwrite your settings. We would like to apologise that the payment notification emails were not sent out as normal on Friday, 08th February. We would also like to reassure you that this does not effect the payment itself, which you will receive on time. Sign On to your AbeBooks.com bookseller account. Select Your Personal Information from the Members Menu. Click Account Details Since Last Statement. Here you can see the amount that will be paid to you. Please be assured that we are investigating why the emails were not sent to ensure that the matter is resolved and does not happen again. We apologise again sincerely for any inconvenience caused and thank you kindly for your patience. Should you require assistance please do not hesitate to contact our Customer Service team, who will be happy to help. AbeBooks are pleased to announce the launch of a new website within new and emerging bookselling markets. The website – Gojaba.com – offers a low-cost, no-frills, online market place for booksellers of used, rare and out of print titles in emerging markets. Gojaba.com is currently available for Russian and Swedish booksellers and will be released for the Portugeuse market in Brasil later on this year. Gojaba.com will help to develop the bookselling business within emerging markets by offering a low cost service for booksellers and a new and exciting shopping channel for buyers. Booksellers within those markets can list up to 20,000 titles on Gojaba.com for a low monthly fee - 99 Swedish Kronor (approx. £8) and 129 Rubles (approx. £2.50). Those Russian or Swedish sellers signing up before the end of February will receive the first 6 months free. The Gojaba.com website works as a listing platform only, providing the link between buyers and sellers. There is no commission and the sales are completed between the buyers and sellers directly - Gojaba.com has no part in that process. Whilst Gojaba.com is owned by AbeBooks, it will be operating as a separate business using different technology and a different database. This is a notice to inform you of an upcoming hardware update that will result in a brief site outage on February 7th, 2008. This hardware update is one of the major steps AbeBooks is taking toward becoming Payment Card Industry Data Security Standard (PCI DSS) compliant. For further information, please visit www.pcisecuritystandards.org. This hardware update will result in a very brief site outage, accompanied by 20 minutes or less of intermittent site performance issues. This outage will be the first of two; the second is tentatively scheduled for the week of February 10th. The first update is scheduled to take place at 02:00 a.m., GMT, on February 7th, 2008. We will provide details on the second outage as soon as scheduling has been finalised. We apologise in advance for any disruption that may arise from this hardware update, but trust that you will appreciate the importance of becoming PCI compliant.